Plans for the SEA-ME-WE 5 submarine cable system have moved another step forward, with two companies contracted to do the heavy lifting. The consortium has tapped the Franco-American giant Alcatel-Lucent and its Japanese cousin NEC to build the system, with each taking responsibility for different segments. 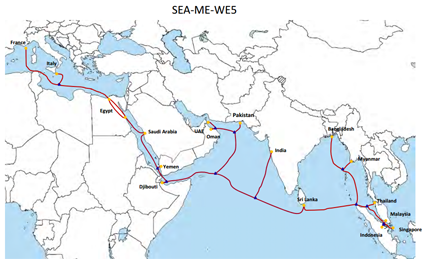 SEA-ME-WE 5 will stretch 20,000km from Singapore to France will have a design capacity of some 24Tbps via 100G technology. Along the way it will apparently land in 15 additional countries: Malaysia, Indonesia, Thailand, Myanmar, Bangladesh, Sri Lanka, India, Pakistan, Oman, United Arab Emirates, Djibouti, Yemen, Saudi Arabia, Egypt and Italy. NEC will be handling the leg from Singapore to Sri Lanka, while Alcatel-Lucent while handle the other legs between Sri Lanka and France. The rather epic negotiations for SEA-ME-WE 5 saw a bit of a bifurcation over the last year, and now we have two cables on the menu. Just six weeks or so ago a similar consortium cable hit the headlines, but with a different members list headed by PCCW, China Unicom, and Telecom Egypt. AAE-1 will stretch from Hong Kong and France along a similar route. The two both seek to meet the growing demand for bandwidth throughout Asia, but is there enough demand on this route to support everyone? It's still a few years before we'll see how that works out for the dueling consortiums. But for Alcatel-Lucent and NEC, winning the contract to build the infrastructure is good enough for them.